"Think about it, Rafe. I'm a trainer and promoter. It's what I do all the time. I find two people, evenly matched. Send out the word. Draw crowds to see them in the same place. ..."
The first thing I noticed when I read this book was how audacious Tessa Dare is in comparing love and marriage to boxing. It's a riddle that the author asks at the beginning of the novel and I knew I needed to keep reading if I wanted to find out how they were connected. Clio has been engaged to Piers Brandon for the past 8 years, and she's tired of waiting. When she inherited the castle, she saw it as a sign to stop waiting and move on with her life. The castle represented security for her -- fortification against the future. That, no matter what would happen with Piers and their engagement, she would always have her castle, because it is something that was given to her and would be hers alone. She just needs Rafe Brandon to sign some papers for her. "He doesn't want me." Her voice broke. "Can't you understand that? Everyone knows. It took me too many years to see the truth. But I'm done waiting. He doesn't want me, and I no longer want him. I have to protect my heart." Rafe has been given powers to oversee to Piers' business while his brother is away. He's been fine with signing for expenses and whatnot, but he never expected Clio Whitmore to show up at his doorstep and asking him to sign for something that would greatly affect all of their lives. Rafe has been his family's black sheep, but he is determined not to muck up his brother's affairs. He plans to convince Clio of his brother's devotion but, what he doesn't count on is having to reveal his own feelings for Clio. Clio and Rafe are both misfits, neither one fitting in well in society -- and it's part of the charm of this book, how it recognises and honors individual quirks: Clio's a lady who possesses an amazing, amazing palate with tasting ale. Rafe is a lord, whose passion is boxing. I especially loved Portia and her mathematical mind. Tessa Dare plays a bit with the idea of what we see on the surface and what lurks beneath: one would not expect the Whitmore sisters to be anything more than society misses and one would not expect Rafe to be anything more but a bored aristocrat raising hell. Then there's Bruiser, who is a stand-out character, by the way, who has decided to "game" the system. He's been given an opportunity to reinvent himself in the castle, and he's decided to be an "Esquire" -- it was a bit funny how Bruiser was able to reduce society's very complicated rules into a very simple formula: when there is a problem, a monocle solves all. Rafe looked at it. "A quizzing glass. Really." "I'm telling you, these things scream upper crust. You should get one, Rafe. No, I mean it. Someone talks over your head? Quizzing glass. Someone asks a question you can't answer? Quizzing glass." "You honestly think a stupid monocle is all you need to blend in with the aristocracy?" It made me laugh, but it also made me think about how quickly we judge people based on their appearance, but there's always more to people, and there's always more to their story. Case in point: Piers Brandon, the absentee fiance. Throughout the novel, we get the impression that Piers is a terrible person -- as cold and distant as Clio describes him to be. We sympathize with Clio and warm to the idea of Rafe, who is there and who shows Clio that she is valued. This was a difficult love story, and I felt a bit sad for Rafe, who was made to choose between his own heart and his brother's. He'd loved Clio ever since they were children, but he had to hide his feelings from everyone, because he knew Clio was promised to his brother. He sacrificed his own happiness for the sake of his brother and their family. I'm not sure there's a right or wrong in this -- and I honestly wouldn't have known what to do if I were in Rafe's position. This revelation does answers the riddle of the similarity between love and boxing: in boxing, matches aren't just haphazardly arranged -- they are carefully considered so that both sides are evenly-matched and that they get a good fight out of the arrangement. Piers is perfect, but he wasn't perfect for Clio. Clio and Rafe are complement each other: their temperaments and dreams are on the same plane and their hearts beat to the same rhythm. A final thought: it's inevitable to compare Clio to The Odyssey's Penelope (and Tessa Dare does make this comparison in the novel) -- I kept thinking about who is more admirable: the one who waited twenty years, or the one who didn't, because we've long thought of Penelope as the gold standard of faithfulness. The question now is: Is Clio less faithful because she didn't keep waiting for Piers? I'm guilty of holding Clio up to such impossible standards and realised that it's part of her story: she's not infallible and she's not perfect -- and she knows it. But she's really trying her best to live the best life she can live, given the resources that she has. I have to admit that I was a bit scared to read Say Yes to the Marquess, because I really loved the first book in this series, Romancing the Duke, and I was worried this second book might not live up to my expectations. It did not. Because it created a whole new set of expectations for me. It showed a different side of Tessa Dare: the side that was willing to test out the mix of humour and emotion and characters that she has done in Say Yes to the Marquess. Zoe Deveraux is a fearless seventeen-year-old. Though disguised as a schoolgirl, when she is spirited out of France by Rolfe Brockford, Marquess of Rivard, her life changes forever. Posing as a Revolutionary, Rolfe is on a mission to rescue innocents from the bloody horrors of the guillotine. Once in London, Rolfe finds himself unwilling to abandon the waifish girl and shocks polite society by taking her as his bride -- in name only. What began as a marriage of convenience quickly grows into something altogether different. But Rolfe and Zoe face countless challenges—from political intrigue to their own pride, jealousy, and fiercely guarded secrets. Now, as the strife in Europe hits its peak, two stubborn hearts must make the ultimate alliance. I've read a few books by Elizabeth Thornton (Trap Trilogy plus some stand-alone novels) and really enjoyed them -- this one is currently FREE on Amazon . Elizabeth Thornton published 28 books before her death in 2010. Her last published work was A Bewitching Bride (2010) which completed her Seers of Grampion series. I'm so, so pleased to spotlight Theresa Romain's Secrets of a Scandalous Heiress, the latest instalment in her The Matchmaker Trilogy. Augusta and Joss's book was released last January 6, and to celebrate the release, Sourcebooks Casablanca is giving away five (5) copies of It Takes Two to Tangle (book 1 in the trilogy). Enter via Rafflecopter below. Heiress Augusta Meredith can’t help herself -- she stirs up gossip wherever she goes. A stranger to Bath society, she pretends to be a charming young widow, until sardonic, darkly handsome Joss Everett arrives from London and uncovers her charade. After having read almost all of Theresa Romain's books (I haven't read Season for Desire), I've come to appreciate Theresa Romain's wonderful sense of humour -- her novels are fun to read, and she's really able to imagine smart-funny moments between her characters, revealing sharp minds and clever wits. Which brings me to the second thing I love about Romain's books: she writes her characters very well: they are multi-faceted and many-layered -- granted some facets are chipped and/or cracked, and some layers are wrinkly and/or frayed, but that is all part of the charm of the world she makes. In Secrets of a Scandalous Heiress, Augusta is a woman who has it all: she's the sole heiress to her family's beauty business and is about to take control over her own fortune (both in the financial sense and the future-destiny sense), but Augusta lacks the two things she longs for the most: her parents and love. She's in Bath with her friend, Lady Tallant -- both of them seeking to recover from events that have left them both a bit bruised and hurting. "I cannot allow anyone to have that sort of control over me. Once I trusted a man too much, and he abandoned me. This time, I shall do the choosing. All I require is a lover. I will take him, then leave him, when I see fit." At the beginning of the story, we get the impression that Augusta pretending to be the widowed Mrs. Flowers is a whim, but, as the story unfolds, we discover the reason why -- and it is heartbreaking. Augusta believes that taking control of her romantic life, by seeking a lover -- on her own terms -- is going to help solve her problems. But, she never realised how difficult it was to find one -- until she bumps into Joss Everett. Joss Everett is a complex character: he's very, very closely connected to a baronetcy, but he has always walked on the peripheries of society because of his Hindu blood and color. The curious thing about Joss is that he has accepted his role as his cousin's sidekick (in the guise of his man of business). His cousin, Lord Sutcliffe, does not respect him or value him -- and Joss has allowed this treatment to continue. We see into Joss's thoughts and we know he hates how his cousin treats him, but we also see that he believes the glass ceiling is set very low for him (and that he can't break through it) -- case in point: even his greatest dream is truly just a modest one. "I try to wish," he said in a calm voice, "for what I know I might attain. For respectable employment for a reasonable wage. For a reasonable employer." There is a blackmail plot in the story, which involves Lord Sutcliffe and a pregnant maid, but there's surprisingly very little action and chase -- because the focus of the story is the developing relationship between Augusta and Joss. There's a lot of talking, but it is talk that one needs to pay attention to carefully, because there's so, so much revealed in their conversations. It's wonderful to see how their feelings evolve through their dialogue. At the onset, it's all careful flirtation and humour, and then it becomes deeper and more sincere, until, finally, real intimacy and honesty. "You would do, Mr. Everett." He froze halfway to a stand, eyes fixed on Augusta's gloved hand on his sleeve. "I would do?" Dropping into his chair again, he added, "I presume you mean as a lover?" He lifted his chin, looking down his high-bridged nose at her. "Because I am convenient? Or because I am entirely unworthy of marriage?" His tone froze her fingers, and she withdrew her hand to her lap. "Because" -- she raised her own chin -- "you bathe regularly and are not bad looking. As I mentioned previously." "But if it's all right with you, I would like to stay here for a short while and be Augusta." "Were you concerned that you might become someone else?" "Yes. Or -- maybe concerned that I would not. I'm not sure how to tell." She lifted her head, then traced an ancient scar in the wood of the desk. "Every caller for Mrs. Flowers requires me to lie more and say less. I can't say anything that's true of my real self; I have to be so careful. And so I wind up saying nothing and smiling like a doll." Loss is one of the central themes in this story (the other is finding a sense of belonging), and Romain really explores this through her supporting characters, Lady Tallant and Lord Chatfield (I'd love to read more about these two) -- Lady Tallant is in an amazingly loving relationship and has given birth to an heir and a spare, but her recent miscarriage of a daughter has proved devastating. She is in Bath trying to regain herself. Lord Chatfield is a marquess and wields incredible power in the form of the knowledge and information he possesses, but he lost his leg when he was a younger man. As I mentioned earlier, Romain's characters are perfectly imperfect, and each one exists for a reason. Everyone had something grieve, did they not? A leg, a parent, an inconstant lover. There was always something more that could be lost. Which meant there was always something for which to be grateful. We can see the characters go through the stages of grief, and the author is respectful of the time each one needs to deal with their own losses (the most heartbreaking is, perhaps, Lady Tallant's.) -- it is very encouraging to see each one come to terms with it at the end of the story. Disclosure: I received this review copy via Netgalley for this event. Thank you to Theresa Romain and to Sourcebooks Casablanca for the opportunity. Yes, this is an honest review. 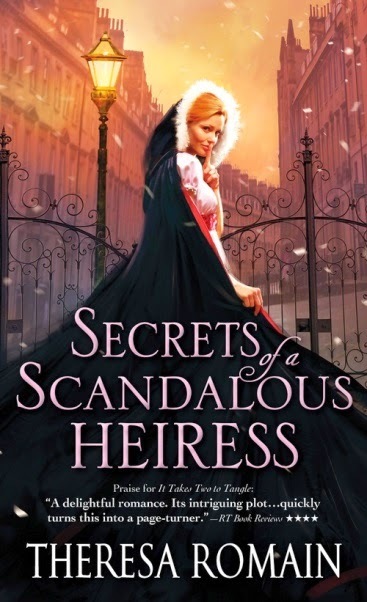 To celebrate the release of Secrets of a Scandalous Heiress, Sourcebooks Casablanca is giving away five (5) copies of It Takes Two to Tangle (book 1 in the trilogy). We've read about different kinds of brokenness in romance novels, and how love heals this. But, in the case of Jasper (and of Ryder from Eva Devon's Once a upon a Duke), love itself is what needs to be healed. The problem with these two heroes is not that they lack the ability to love, but at they had loved so much and had gotten burned in the process. The challenge for them to learn to love again. Romance is always about the idea of finding "The One" and Jasper had found her, and lost her. Is it really possible for him to find another "one?" It's a question that Jasper thought he had answered with a "no" and this is where the problem begins: when he meets Katherine, a spark lights up in him, and he struggles to squelch it, fearing that he is betraying his late wife's memory. Panic built in his chest; it pounded away at his insides as he confronted the nauseating truth -- he'd lost count of the days since Lydia had been gone. His gut clenched. How, in a matter of days, had this happened? Katherine knows that Jasper has experienced a terrible tragedy, and she wants to help him move forward. But, how? Katherine is a wonderful heroine. She's a pragmatist, in contrast to her twin, who is a bit more romantic. Katherine is a bit wary of love because of her father's betrayal and has vowed to protect her own heart from such devastation. At the beginning of the story, Katherine seemed a bit passive, allowing her twin, Anne to take the lead in their quest for a heart pendant believed to win whoever wears it the heart of a duke. As the story progresses, Katherine shows her real self -- a woman who thinks and acts for herself. When faced with the very real and immediate danger of her marrying her despicable cousin, Katherine takes it upon herself to find a way out: she arranges her own marriage of convenience to Jasper. She's not perfect, though -- or infallible: she believed she would be able to guard her heart against Jasper and that they would have a relationship free of messy entanglements. Christi Caldwell was really able to tap into the deeply painful and emotional wellspring of loss and grief. I understood Jasper's confusions about what he felt for Katherine juxtaposed with his feelings for his late wife. In her bio, the author cites Judith McNaught as a writing influence, and I could feel the same high drama and strong emotion in her novels. The dialogue was excellent and I enjoyed the interaction between Jasper and Katherine, especially the scene in the bookshop. I loved the dynamic between Katherine and her sister -- twins, who are physically alike, but who react to the world so differently from one another. "Does the pendant stipulate as to the qualities of the duke? Must he be handsome? Or can he be a doddering, old letch?" Anne wrinkled her nose. "Whoever would any young lady desire a doddering, old letch?" "Why, indeed? So then, it is the heart that is more important? Or the ducal title?" Anne angled her head, and again the bonnet pitched lower over her eyes. She nibbled at her lower lip, and then said, "Why, I rather think they are of equal importance." Katherine took a deep breath and forced herself to count to ten before speaking. "Anne, there is not an overabundance of eligible young dukes in the market for a wife." Her sister held up a finger encased in the white kidskin glove. "Ahh, but we do not need an overabundance of dukes, Katherine. We merely require two." I really enjoyed this novel, and plan to follow this series. Disclosure: I won this book from a giveaway hosted by the author. Yes, this is an honest review. *There's a prequel to For Love of the Duke called In Need of a Duke , which is a 94-page novella and tells the story of Aldora, Katherine and Anne's older sister.